WILTON - The Selectboard set a date for a public hearing and special town meeting to bring several issues to the townspeople, including the Forster Mill demolition and a Central Maine Power transmission line project. The meeting will be held March 5 at 6 p.m. at the Town Office. A public hearing will be held, as required by the state, prior to a vote on the acceptance of funding for the Forster Mill site cleanup. The town was awarded a $150,000 grant, as well as approved for a $150,000 loan from Androscoggin Valley Council of Governments to complete the demolition project, which has been ongoing for the past year. At present, the town's activity at the site has cost roughly $546,000. Approximately half of that was obtained through grant funding, while Wilton has also employed $48,000 from the Undesignated Fund balance and $200,000 in interest free loans. 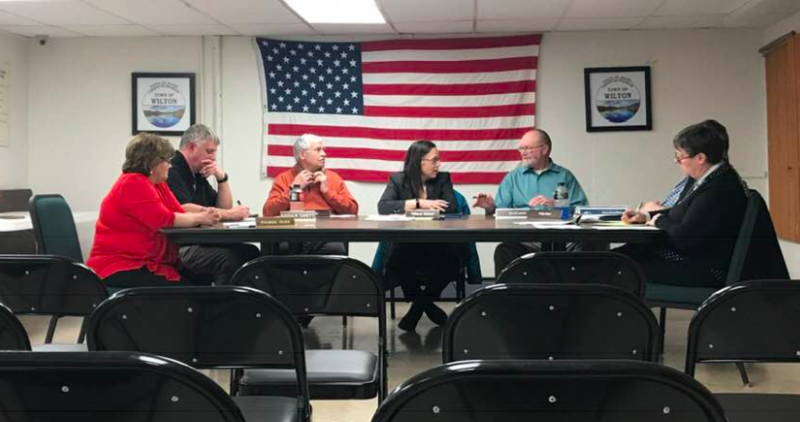 The town was approved two months ago to receive an additional $100,000 in federal Environmental Protection Agency grant funds and another $100,000 in interest free loan money. Following the public hearing, the special town meeting will ask voters to accept or deny the funds from the state. The meeting warrant will also include an article that will allow residents to decide where they stand with the New England Clean Energy Connect project. The NECEC, if approved by the state, would bring 12 miles of new corridor across Franklin County, as part of a larger project that would transmit 1,200 megawatts of power from a Canadian hydroelectric company, Hydro-Quebec, to the New England grid. The board originally voted to support the project, but decided on Tuesday to put that decision before the town. According to Selectman Tom Saviello, a settlement agreement has been drawn up between the Public Utilities Commission hearing examiners, Central Maine Power, the Office of Public Advocate and the Industrial Energy Consumers Group. "You might hear what they have to offer and think it sounds pretty good," Saviello said. Due to the confidentially of the meeting, details have not been released, but more information is expected, according to Saviello. The article will give residents the choice of either rescinding support, remaining neutral, or to support the project. For 199 years Maine citizens, wood lot owners and politicians protected the North Woods from permanent development. That was true until recently. Now we have some questionable and self-serving politicians, meeting behind closed doors with managers of a foreign power company in Hallowell, essentially attempting to pilfer enticements for continued support of a permanent transmission power line passing through our Maine woods. Nothing good will come from this transmission line. Boss Tweed would be proud of these folks. Tom White, you beat me to it. Same thing with wind development--an even bigger blight on the landscape. A sacrifice those in southern New England are unwilling to make. Stop selling off Maine to the power hungry people of Massachusetts. NO CORRIDOR, period. No enticements, no compensation for towns outside the corridor, no rhetoric will ever return those forests, streams, wetlands, and back yards to their current condition. And that's just the removal of trees and habitat in the actual corridor. What about the collateral damage to bird and small animal populations in the surrounding areas from the hum of the currents to come? From the blasting that surely will be necessary in our granite-riddled state? From further decimation for roadways that will have to be built to access the construction areas? How will the removed timber be handled? Trucked off to Canada as free lumber and firewood? We won't get the power, but we HAVE the power to stop this. Please go to the meeting. Please voice your opinion. Don't let NECEC take your forests and give you a pencil in return. That was a good move to put the decision making power into the hands of the townspeople of Wilton. Others should take note and do the same. I must admit that settlement agreement, which was identified as private, but for some unknown reason appeared publicly in the Sun Journal, sounds sweet. But with that being said, why do I feel like the Maine people would be selling their souls to an inept power company that can't take care of what they have now? Extorting more money from CMP doesn’t make this project more appealing. Let me be clear to all, apparently a suggested settlement agreement is how projects like this are done. Those that are interveners were asked to participate. ANYONE could have applied to be an intervener. Again, I said anyone…. Politicians, citizens, various groups….ANYONE. If they had they would have been in this meeting called by the PUC. Terry said it best…. Wilton can decide to support the project or not. This is NOT a selectmen’s decision. All the towns should take the same public process as Wilton. I hope they do. I think it's a great idea to allow the citizens of the town to decide. This project will FOREVER impact our region, our environment, our tourism industry, and our forestry industry. Say NO to NECEC. The Earth was here long before us and will be here long after we are gone. No matter what we do to it, it will abide (and heal). For now I for one like being entertained by electrical appliances such as the one I am now writing on in my electrically heated home, eating electrically cooked food, washing in electrically heated water and working with electrically powered tools. I pay for this in money I have earned myself and it pleases me that I can. I see nothing wrong with electricity flowing by my house from Canadian waters to light Fenway Park and Gillette Stadium. I like watching sports. I also like the look of windmills on the horizon. It reminds me of what Man can do. It makes me proud. In response to NOT QUITE DEAD YET.....do the math. Maine ratepayers will see less than a $3 to $5 savings on their electric bills. I love the ease & convenience of electrical appliances as well, but the NECEC project provides none of this for Maine. Hydro will be delivered to Massachusetts residents. And CMPs recent effort to "sweeten the pot" sounds pretty good on the surface. But again....do the math. Maine ratepayers will see a miniscule savings. And have you seen these proposed transmission towers? Nothing like what exists currently. Take a drive up to Quebec. What an eyesore. And these will be visible everywhere....from every summit of just about every peak. Besides....there are other forms of power that are less offensive to Maine's ecosystem. Arleen, I think some people just don't get it. I try not to worry about a few sour grapes. That crap is going to be less than 1,000 feet from our mail box and we will be able to see the towers and lines. I have been at all the meetings as I will be at the meeting on the 26th @ 6:30 and hopefully the town will move the meeting to the community center so every one can get in the room and be able to be heard. I don't care if they pay my taxes for the next 10 years I DON'T WANT THAT CRAP IN MY DOOR YARD !! This has NO place in Maine what so ever. It will do nothing for us. Why shouldn’t Massachusetts people have electrical power from Canadian hydro? They are just like us, aren’t they? I think they will appreciate that we let these lines go through what looks to me like a really narrow space. Maybe they will produce things with this power that we can use. I also like the look of those towers, so geometric and symmetrical. Farmington? Are you willing to bring this to the people?
" I also like the look of windmills on the horizon. It reminds me of what Man can do. It makes me proud.". it reminds me of what man CANNOT DO. I "wonder" why there are no wind turbines littering up the Beautiful Berkshires in Western Mass?? Because it makes "Them Happy" to Not Have Them in Their Back Yard. Proud of our NE Patriots too..!!! They'll be fine without ruining the mountains in Maine. Guess what ? Massachusetts customers will be paying more for this electricity than Maine customers and, because, the outlet for all this energy is in Lewiston, Maine will consume the most of it, too. Thank you both. Your posts are very interesting. Can you imagine if other infrastructure improvements had to bribe the town's to get approval? Maybe CMP should stop delivering power to the communities opposed to progress. Let them live in darkness and back to nature bliss. The whole NIMBY crowd is pathetic. If you don't want electricity then by all means complain. But if you use electricity then stand down and brace for the future. At least it's the most reliable green energy on the planet. Way better than wind and most of the power lines are already there. Well Not Quite Dead Yet, to hear the President of CMP tell it, your assumption that the earth will be around long after you and l are dead is just plain wrong. Unless they build that corridor of course. Personally I think that one of the biggest untruths that has been promoted by CMP is that by cutting 53 more miles of corridor to supply Massachusetts with power will help solve the global warming issue. Last l knew over 63 percent of carbon emissions were coming from developing countries. CMP can cut all the corridors they want but it’s not going to stop a country like China from releasing double the amounts of carbon emissions as the US. By the way, does anyone know how much revenue CMP will get from this deal? With the hydro dam produced power coming into Massachusetts, is that hydropower displacing other power? Is that other power hydro? Gas turbine generated? Coal generated? If the hydropower is displacing any carbon fuel derived power for Massachusetts, won't we have a bit cleaner air in Maine? We are a bit of the tailpipe for power plant emissions for much of Eastern United States. Is cleaner air a benefit? I think it is when we can get it. Complex situation. I do like electricity. I just don’t think Maine should be a conduit for Massachusetts electricity. Thank you all. I enjoy a good circular arguement. It passes the time I have left and gives one something to which to look forward. I don’t get out much and no one visits except those who want money or votes. It is so much more rewarding than sitting in jail like I used to. Perhaps when the zombies come we will meet again. One of the main arguments I keep hearing is that this will be providing power to Massachusetts. The Eastern power grid. Includes Maine. The hydro power from Quebec's grid would be transfered to the eastern grid to be used by everyone. For those who don't understand we, the people of Maine are included in "everyone". Most of the power lines are already there. We would all benefit. It may just allow us to do without another windfarm that isn't reliable and can't sustain itself without taxpayer funded subsidies. Do you think they would pay me to do that? I’m saving up for a present for Sweetie. Mr. Diamond is too smart for me, though. I fear he might become annoyed with me and fall off his stool again. I really don't care what Wilton has to say or any other town not directly influenced by the line for that matter, It is not protected wetlands, or virgin old growth forest, the land has been cut at least once, most of it twice. There are logging roads all over that area, it is my backyard, I hunt, fish and trap that area of Franklin and Somerset counties all year long, I bet if I showed 1000 people a blank map of Maine and gave them a red crayon and said "Draw the NECEC." Maybe 6 people could do it, and that's a stretch. Or even easier, find Kennebec Gorge on a blank map. For the length of that line Maine gets property taxes, The herbicides they will use are organic and are only toxic in large doses, like drinking a gallon of the raw materials. And seeing how CMP has been spraying existing polelines with these same herbicides with no ill effects, they are not going to effect the new line either. Eddie- it is theorized, and CMP had notes exposed to the effect that the corridor will then allow for easy access to windmill generated power from multiple access points along its route. According to Maine. gov the herbicides currently used by CMP carry a caution label along with a list of ‘Hazards to Humans.’ Applicators and others must wear long sleeved shirts, long pants, and chemical resistant gloves. I’m willing to bet CMP has their workers go a step further and wear Personal Protective Equipment. They should, and l would also if l was spraying a herbicide with the name of Arsenal or Stalker. A little different than Citronella don’t you think? Have a great day and l hope too see you all at the meeting on the 26th of this month. OK. I’ve listened carefully to all of you and have decided to vote yes on the pipeline when it comes up. All around I think it will be best for Me. Now Wilton can tear down the rest of the old mill and use the dam underneath it to make power, too. Hey bro, since you are just about to check out maybe think about the rest of Maine and it's future residents. ( it's for the children ) After all, what's wrong with buggy whips and carriages? Terry, Go read the MSDS on each of the herbicides, Citronella is actually a lot more harmful than any of the herbicides CMP currently uses. Powerline Arsenal in rats in the amount of 5000mg of dry chemical, that is a little more than a tablespoon full before any ill effects were noted, then again a tablespoon of salt in rats is harmful. And they are plant specific and don't affect natural forage. Citronella on the other hand, kills bugs and animals and causes "wet Lung" when inhaled. Yeah Citronella is awesome...Geez, do some research before commenting like that. It is my honor to announce that I will be more than canceling out NQDY yes vote by actively participating against any and all such projects for many more decades to come. No now and no later. Thanks Snotty nose kid ! We need more like you out there. I say NO the any corridor. Thanks again. I say unfortunately money is root of all evil. If CMP puts up enough of it the power line will be built. It’s quite amusing to see people whine about a power line as they gobble up electricity. Mommy, where does ‘lectricity come from? Oh, from nearly 2000 miles of high voltage lines in Maine (Maine.gov) and countless miles of regular service lines. Mommy, what’s a hypocrite? I could live without electricity if I had to, I still say NO to the corridor! Please say NO to the cmp corridor. This will ruin more of our already dwindling mountain views which we depend on for our tourism industry. We have lost almost all of our other industries in the north western mountains here. The skiers that come up from Massachusetts and other states will not like the ugly views they have to look at while they're skiing our beautiful slopes. Our Businesses will suffer our health will greatly suffer from the high voltage EMF emissions. Just look at the severity of problems people in the midwest are suffering from the massive EMF emissions from the massive and ugly windmills they were forced into letting them build. Those ugly highline are very dangerous for our health and very ugly. It's not going to benefit Maine residents in the area who would have to suffer the consequences of them. NO...NO..NO NO...GO SOME PLACE ELSE WITH YOUR UGLY TOWERS. LEAVE MAINE ALONE!! !